We all love AutoCAD express tools, aren’t we? AutoCAD express tools has many handy tools, that can speed up your work significantly. They can do things that you can’t do just with default AutoCAD tools. But do you know there are some tools that we can use… only by activating them using command line? One popular tool in this category is BCOUNT. Speedy way to count how many blocks in your active drawing. I prefer data extraction, but BCOUNT can give quick result for review. Where can I find the rest of these tools? In express tools help, of course. 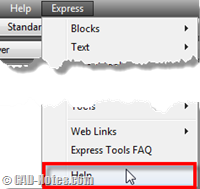 Express tools help is separated with AutoCAD help file. If you are using AutoCAD menu (with or without classic workspace), you can open it from AutoCAD menu: express> help. If you don’t use menu, I don’t know if there an access to open it. At least I can’t find it on express tools tab. Expand categories in contents’ tree. Expand command line only. You will find the tools there. There are many interesting tools here. Some that you may find it useful are: BSCALE, GATTE and TFRAMES. 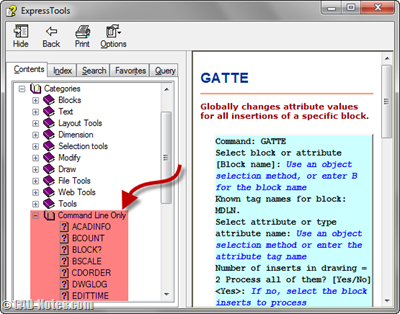 GATTE can be very useful if you have many common values in your block attributes, but you prefer not to link your attributes to external excel file. You can change all of them at once using GATTE. You can use TFRAMES to quickly turn on/off wipeout and image frames. There’s also SSX, similar to QSELECT but without dialog box. Well, you may have your own favorite. You can share in comment section what it is! Great tip. Thanks for sharing. I use tframes, flatten, and extrim the most. Way cool for us old school typers..